When people refer people they love, to people they trust, that is the finest compliment you can give. The Martinchek Team's reputation and business are built on referrals. It is our goal to make all customers and clients raving fans through outstanding service. Here is what a few of our past buyers and sellers had to say. We wouldn't have our lot. . . on Mullett Lake if it weren't for their persistence and help! Thank you again for your excellent service & advice! The Martinchek's set a standard in their profession that others should strive to achieve. They understand that there is more to selling a property than the mechanics of listing, advertising, and showing. In most cases, peoples' lives are in turmoil to some extent, and your attention to human needs and emotions sets you apart. I appreciate all you have done and will recommend you to any who will listen. Please feel free to use me as a reference in the unlikely event that a potential client needs reassurance that you are their best choice! Due to unfortunate circumstances, I found myself in a position where I had to sell my beautiful home. I was referred to the Martinchek's from several people based on their reputation. The experience I had with Audrey and Joel was excellent. I found them to be extremely professional and hard working. The process was cumbersome as my home was off water and over built for the market. Audrey came out, and looked at my home, and gave me some good suggestions to help its salability. The Martinchek's attended the appraisal, inspections and closing. They were truly instrumental in my home selling. I believe if I had not had the Martinchek's my home would not have sold as quickly, or for the amount that it did. We ran into several obstacles with the purchasers and their financing. Audrey worked to secure a renter for the purchaser's home, which made them eligible for their financing. The Martinchek's worked diligently to resolve one issue after another. I would highly recommend Audrey and Joel to anyone thinking of selling their home. Bill Skowten, Owner of Creative Cabinets Inc. The personal phone calls helped to relieve anxiety. We didn't feel like there was a question we couldn't ask. Their concierge program was dynamite! It made setting up a new home in another state easy, Thanks! I liked their prompt service and easy access. They resolved situations and problems quickly. Their service was excellent. As military, my schedule with overseas duty complicated the process. It took us years to find a piece of property that was right for our needs! The Martinchek's never gave up on us! They helped us find property to fit both our needs. From day one to closing . . .things couldn't have been done any better in my estimation. I am dedicating my new kitchen to you. You're the Greatest . . . thanks for the quick, professional way you handled our sale! Go getters . . .both Audrey and Joel! Keep up the good work. Above and Beyond . . .the call of duty, no matter what time of day or night. Audrey & Joel's follow through, attention to detail, outstanding negotiation skills and personal touch are great. They are energetic and motivated agents who are class acts!! They are the reason I bought this home up north. 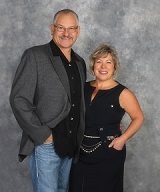 I have bought and sold numerous home and Audrey and Joel are the best agents I've ever had! Availability . . . you took care of and checked into every detail and had a true willingness to help. You and Joel went the extra mile and gave me hope that I could own my own home! I loved your frankness, integrity, and exceptional work ethic throughout the whole process, and will definitely be back if I'm in the market to buy another home. You put your heart and soul into your job, it is apparent you love helping people. You made my transition from the country roads to my beautiful in town home a dream come true. You are assertive and you really work for your clients. I would happily refer you to my family and friends in the future. Their knowledge of the real estate market was remarkable. They were professional, personable, efficient, and friendly. Their ability to anticipate problems and solve them eased our worries and assured us that we truly selected the very best real estate company to serve our needs. Responsiveness, commitment, energy, fast and efficient, listened to what we wanted, extensive network for surveys, inspections, loans and repairs. Took time to explain all phases of the sale and kept us up to date on progress, trustworthy!